In the video he explains he was a member of the Republican Guard in the Syrian Army, displaying his ID, and was given the uniform to wear. 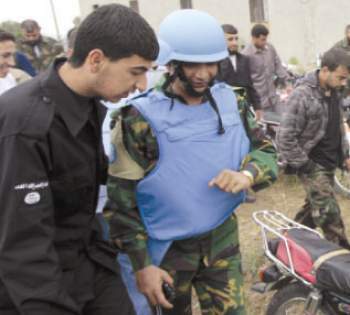 Images of him wearing the uniform were then used in the Syrian media, including this article where he's meeting UN inspectors, described as "Armed takfiris with UN inspectors". "UN inspectors with Armed men" the title says, the takfiris bit is unrelated apparently, the very top title is about "Takfiris take over of a church, evicting the community out of one of the villages", the other says "UN inspectors with armed men", the article goes on to say "The UN only blames one side, while ignoring elements of Al Qaeda "Jihad" entering Syria and murdering its people".